Every year during Good Friday, my family in Philippines cooks a huge pot of “binignit” that will serve as our only meal all throughout the day. It’s a tradition that we faithfully follow as Catholics as part of “fasting” to remember Christ’s agony on the cross. 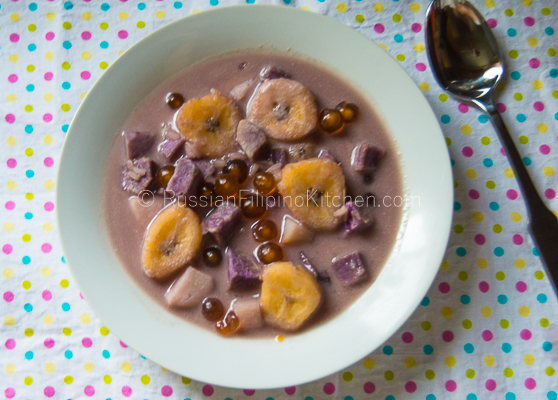 Binignit, a sweet root crop and fruit stew in coconut milk, is well-known in the Visayan region of the Philippines particularly in the province of Cebu where I came from. Although commonly prepared during the Holy Week, it is nevertheless one of the most popular snacks and desserts among Filipinos, which can be served hot or cold. It also goes by the names “ginataan”, “ginatan”,”ginat-an”, etc. in other parts of the country. 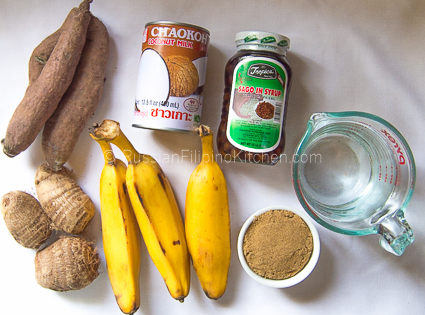 This sweet stew in coconut milk is made up mostly of tubers or root crops which are mainly taro roots (gabi), sweet potatoes (kamote), yams and cassava root. 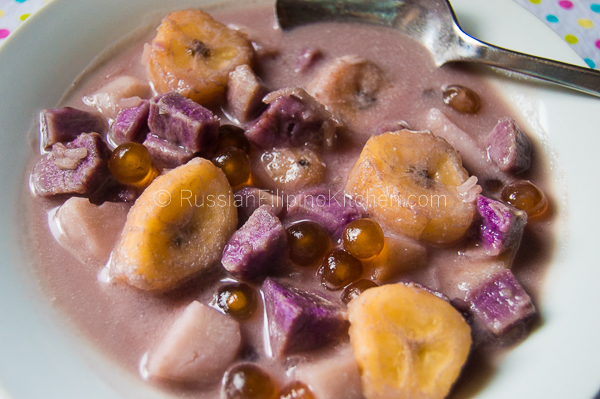 Saba bananas are also added, as well as jackfruit, tapioca pearls (sago), and landang (palm flour jelly balls). Tapioca is a starch extracted from cassava root used as a thickening agent in various foods. Making binignit is pretty simple and easy. The following recipe is the typical way I make the dish depending on the available ingredients I can buy from the Asian store. Back in Philippines, they are easily found in many markets and grocery stores but since I live overseas, I have to make do with what I have. Since I cannot find landang here, I just omit it, and also have to use canned coconut milk instead of freshly squeezed, and tapioca pearls in syrup instead of the dry ones that you have to pre-soak in water. This rich and creamy stew makes a great snack or dessert any time. 1. 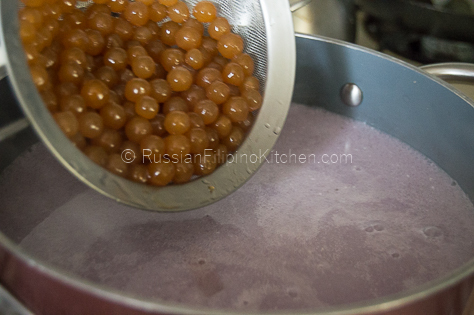 Drain tapioca pearls using a fine mesh strainer and set aside. If using dry tapioca, prepare ahead of time by soaking them up in cold water overnight. This will rehydrate and make them double in size. 2. 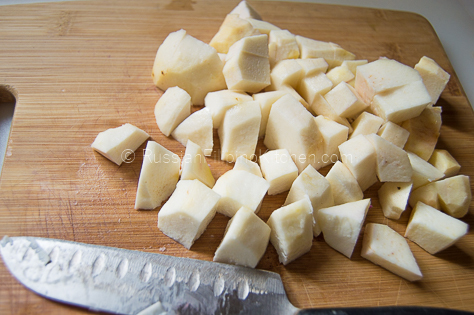 Peel purple yams using a peeler or paring knife, then cut into ½ inch cubes using a regular knife. If you like bigger chunks, go ahead and cut them into 1-inch cubes. Note: smaller chunks cook faster, look more appetizing on a plate, and make chewing much easier. 3. Peel and cut taro roots the same way as specified in step 2. 4. Peel bananas and slice across into ½ inch thickness. 5. 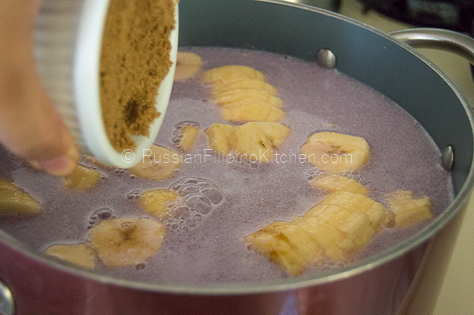 Place cubed purple yams and taro root in a large cooking pot or 5-quart Dutch oven. Add 8 cups of cold water. 6. Place pot on the stove and bring to a boil over high heat. 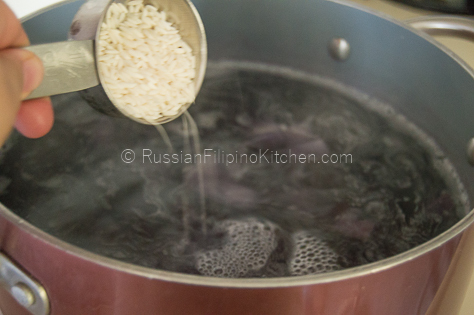 As soon as it starts boiling, add the unwashed sweet rice, then turn the heat down to medium low. Simmer for 30 minutes, stirring occasionally until they’re tender (pierce with a fork or the tip of a knife). 7. 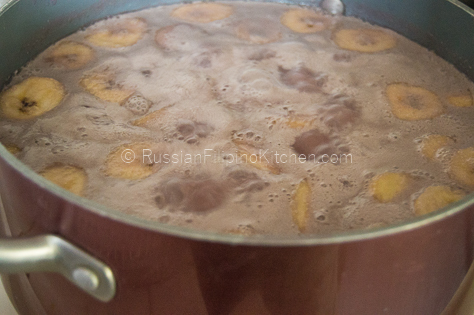 Add coconut milk, sago/tapioca pearls, bananas, and sugar into the pot. Stir to mix. 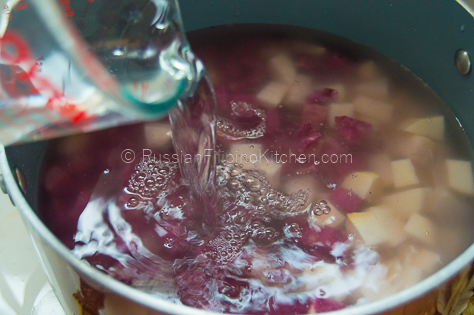 Cook for additional 20 minutes until everything is cooked through, and the liquid has thickened a bit. 8. Remove from heat, ladle into individual serving bowls and serve hot. 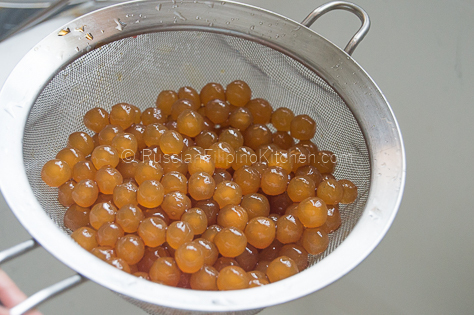 Drain tapioca pearls using a fine mesh strainer and set aside. If using dry tapioca, prepare ahead of time by soaking them up in cold water overnight. This will rehydrate and make them double in size. 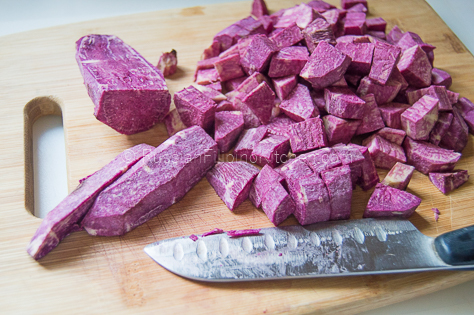 Peel purple yams using a peeler or paring knife, then cut into ½ inch cubes using a regular knife. If you like bigger chunks, go ahead and cut them into 1-inch cubes. Note: smaller chunks cook faster, look more appetizing on a plate, and make chewing much easier. Peel and cut taro roots the same way as specified in step 2. 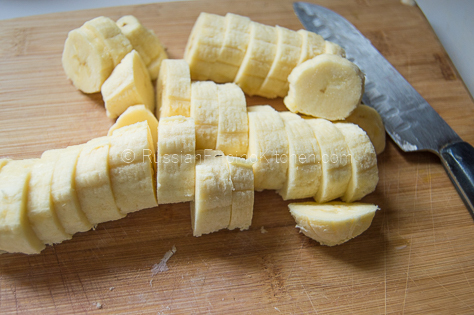 Peel bananas and slice across into ½ inch thickness. Place cubed purple yams and taro root in a large cooking pot or 5-quart Dutch oven. Add 8 cups of cold water. Place pot on the stove and bring to a boil over high heat. 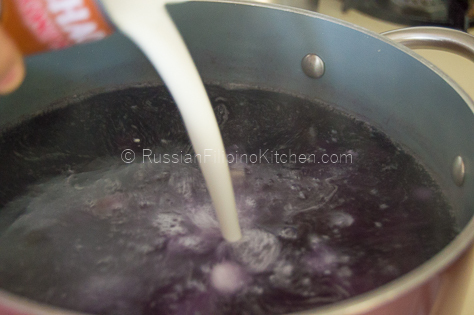 As soon as it starts boiling, add the unwashed sweet rice, then turn the heat down to medium low. Simmer for 30 minutes, stirring occasionally until they’re tender (pierce with a fork or the tip of a knife). 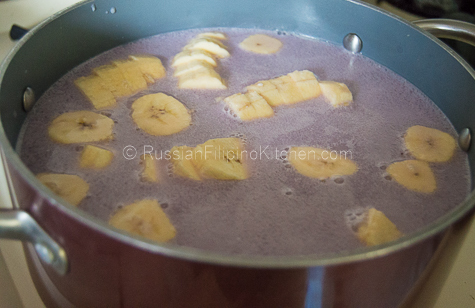 Add coconut milk, sago/tapioca pearls, bananas, and sugar into the pot. Stir to mix. Cook for additional 20 minutes until everything is cooked through, and the liquid has thickened a bit. 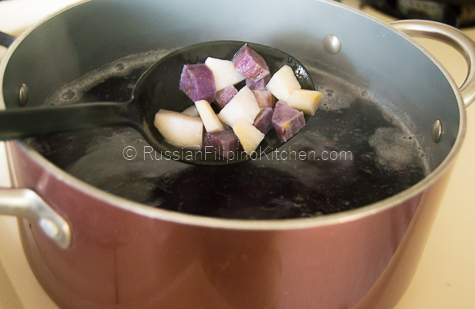 Remove from heat, ladle into individual serving bowls and serve hot.